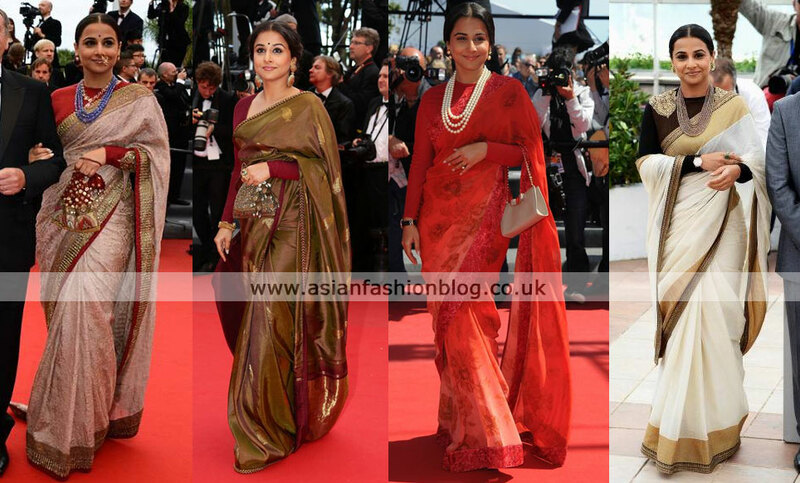 Followers of Asian Fashion Blog on Facebook will have seen me posting photos of Sonam Kapoor, Aishwarya Rai and Vidya Balan's outfits at Cannes 2013 and now I've finally got round to writing a full blog post dedicated to Asian fashion at Cannes 2013! I have to start with Indian designer Sabyasachi, who provided a whole wardrobe of outfits for Cannes 2013 jury member Vidya Balan as well as some of the other bollywood celebrities. Out of the three lehngas above, I'm more drawn to the two on the right. I wouldn't have chosen Vidya's styling of having her hair covered in the far right outfit as it looked a bit weird on the red carpet, but in her defence, it was apparently raining that evening! My favourites are the two on the right. Not a big fan of her hairstyling overall, I prefer hairstyles with a bit more volume, and there's the nosering she wore in the outfit on the far left...check out my earlier blog all about statement noserings. The Sabysachi Mukherjee Facebook page posted some behind-the-scenes photos of Vidya's fittings for her Cannes looks, you can view it here. Nimrit Kaur's black Sabyasachi outfit was a similar style (but different colour) to an outfit Sridevi wore when she was promoting the film English Vinglish. View Sridevi's white version here. Style queen Sonam Kapoor had two main asian outfits for Cannes, starting with this Anamika Khanna sari and jacket. There's no denying this is a beautiful outfit but for some reason I'm not liking the way she's posing in it, we all know this girl knows how to pose on the red carpet, but in the above pics at least she doesn't do the outfit any justice. I didn't really like the look and have to agree with High Heel Confidential's tongue-in-cheek description of this as "A wealthy-young-Sicilian-widow-still-in-mourning-forced-to-attend-a-gala-to-snare-her-next-husband"
This next outfit by Abu Jani Sandeep Khosla split opinion with some people putting it down as "worst dressed"...personally, from this picture I really like it - especially the close up details you can see on the right. I like how she's styled her hair in this outfit too. Manish Malhotra was another big Indian designer who dressed a Bollywood star at Cannes 2013. Ameesha Patel was seen in two of his outfits and considering I'm not a fan of hers at all, I think she looked good! Who were your favourites from the Cannes 2013?